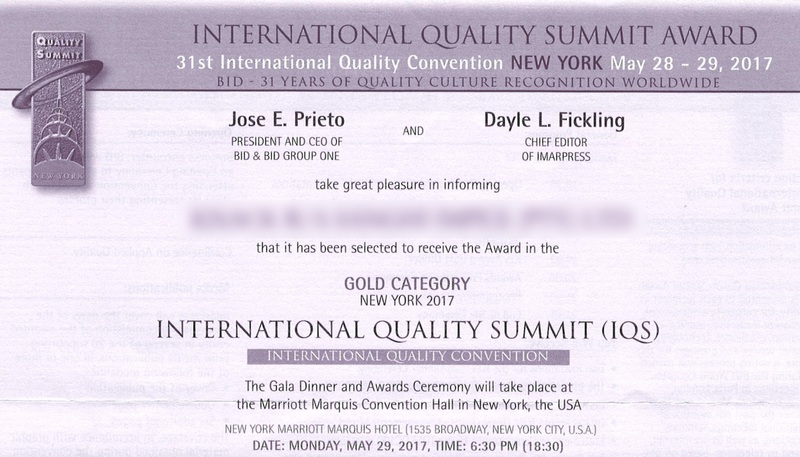 I just received an invitation from the international Star Award For Quality and would like to ask you to assist in its authenticity. It seems to be a very good award and opportunity and would like to get more information before I make any payment as per their request. Thanks and looking forward to your usual support. 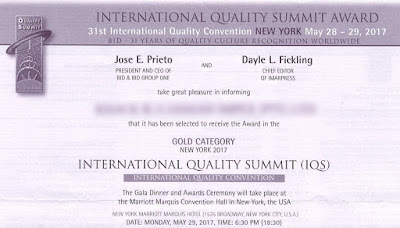 I believe that this “International Quality Summit Award” scheme, run by a company in Spain called “Business Initiative Directions” is deceptive. As far as I can establish there are no genuine criteria used to identify the companies that are selected for the awards. I believe that it’s no more than a money-making scheme by the organisers. Many people had received surprise emails from BID over the last few years, announcing that they’d won an award and inviting them to collect it at gala dinners in exotic places such as Paris, New York and Geneva. It was never entirely clear how they’d won, how winners had been selected and what qualified Business Initiative Directions to award anything to anyone. BID charge companies €4,200 (about P50,000) to receive the award and that doesn’t include the travel costs associated with flying to Geneva. It just covers attendance at the gala dinner, some certificates, a prize and some photographs of people accepting these dubious awards. I’ve done the maths and I suspect that BID make a huge amount of money, probably about P30,000 from every “award” they give away and that’s what the whole thing is about. I can think of many better ways to spend the P75,000 that it would probably cost to receive this dubious award. Why not invest the money in an upgrade to your web site, some quality marketing or better still, an awesome Christmas party for your staff! Don’t forget to invite me too! I took my car for service at a garage in Lobatse on the 28th of June. Then I travelled to Francistown on the 1st of July only to find out that the battery is boiling. I took the battery to a specialist because it was still under warranty and they told me the car was over charging but they gave me a new battery nonetheless. I took the car to another garage from the same chain in Francistown and they told me I had to pay P850 for diagnosis. My question is isn't it that when the car goes for service they are supposed to check all the faults in the car? Firstly, I’m impressed that the battery specialist gave you a new battery even though they probably didn’t have to. That’s the sign of a good company, that they’ll bend the rules a little bit for a customer. I’m sure you’ll be using them again in future. Regarding the garage, no, I’m not sure they are obliged to check everything in your car. A routine service just checks a few basic things unless you’ve asked them to check something in particular. They can’t really be expected to check every component in your car in the couple of hours a routine service takes. I suggest you go back to the garage that serviced your car (or a better one if you know of one) and ask them to check the electrical system in your vehicle before something much worse happens.